The word “puya” in Spanish means a pointed stick or tip of a spear. This term refers to the pepper’s thin, pointy shape. Puya peppers are fairly hot, at about 7,000 on the Scoville scale, a measurement of pungency named after the scale’s inventor and pharmacologist, Wilbur Scoville. The Scoville scale increases with the amount of capsaicin a food contains. Bell peppers contain no capsaicin and have a Scoville rating of zero, while the Carolina Reaper pepper achieves a rating of 2,200,000! Hotter than jalapeño peppers, and about double that of guajillo peppers, puya peppers have a fruity flavor, with a hint of cherry that is favored in hot salsas and other Mexican recipes. They can also be used in any recipe where their fruity heat adds just the right touch. 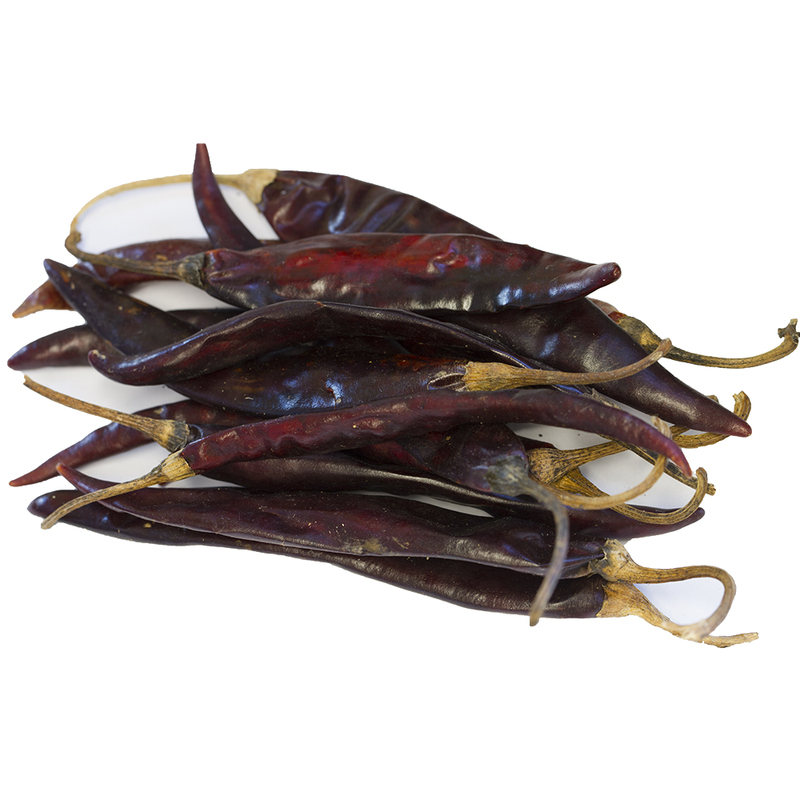 Puya peppers are slightly smaller than guajillo peppers, with a flavor that is complementary to the cranberry crispness of the guajillo pepper. Puya peppers can be substituted in those recipes that call for guajillos. Whole dry puya peppers are typically chopped, broken into flakes or ground into powder for use in cooking. Salsa recipes are some of the simplest uses of puya peppers. Whole, dried puya peppers are lightly toasted, boiled to soften, and blended with other ingredients for a salsa that will keep in your refrigerator for several days. A small amount can add just the right heat to breakfast, lunch, and dinner. Puya peppers are welcome guests in a traditional three peppers stew (guisado a los tres chiles), where they can either replace guajillo peppers or balance guajillos and anchos as the third pepper in the recipe. The combination of three complementary peppers pulls together the pork, beef, or chicken with the sesame seeds, garlic, cumin, and onion included in this stew. Mole sauce offers a unique chocolate-based topping for meats, enchiladas or anywhere your creativity may take you. 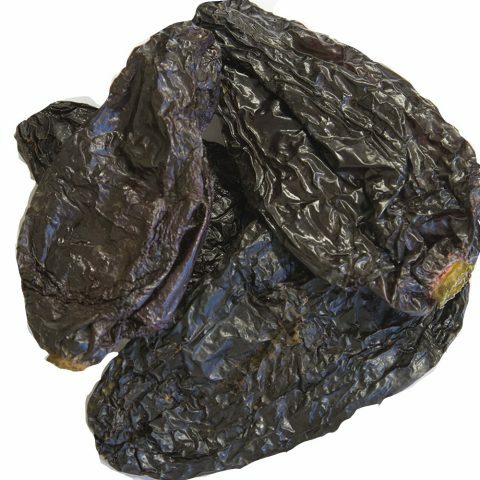 Puya peppers can substitute for guajillo peppers in mole sauce, working well with the peanut, raisin, and dark chocolate flavors. Puya peppers work well as a general purpose seasoning. Grind and sprinkle some onto pizza to give your slice a more nuanced flavor than the crushed red pepper found in your local pizzeria. A dusting of ground puya peppers over simple desserts such as ice cream and chocolate cake will add a novel pepper sweetness and heat. Peppers of all types have been grown for ages in the welcoming climate of Central and South America, Mexico, and the West Indies. Explorers of these regions such as Christopher Columbus brought peppers back from their travels to Europe. These plants then migrated further through trade activities, before returning to the Americas with the Europeans, during the period of colonization. Peppers can grow very well with basic care and attention to several details. The commercial production of peppers requires reliable, direct sunlight, sandy soil that drains well, and plenty of organic material. Peppers need moderate watering but don’t need much fertilizer and have good natural resistance to insects and disease. In areas with challenging growing conditions such as Ethiopia, researchers have found that dry coffee husk and dry vetiver grass mulches can improve the quality and quantity of certain pepper varieties. Grown from seeds, pepper plants require a temperature of at least 70 degrees Fahrenheit for germination. Pepper plants from seeds are ready to transplant in two to three weeks and if sown indoors may require a “hardening off” period during which time the seedlings are gradually acclimated to the outdoor environment. Typically planted in rows from twelve to eighteen inches apart, sweet pepper seedlings can mature in one to three months but hot peppers can take up to five months to mature with fruit. Harvesting peppers earlier results in higher yields because the plants create new flowers to produce more fruit and seeds. Puya peppers, however, are typically picked late into their maturity when their flavor peaks, and dried to their characteristic deep red color, which inclines toward purple. Our Puya peppers are grown in New Mexico, an area of the world where peppers of all kinds have been cultivated for centuries, due to a particularly favorable climate and very suitable soil. As of 2007, New Mexico was responsible for over half of the total chile pepper production in the United States. These peppers alone are in the top six crops of all produce that generate significant revenues and employ thousands of workers from Santa Fe to the Hatch and Rio Grande valleys. Pepper farming is so important to New Mexico culture that the state is home to the only nonprofit, international Chile Pepper Institute, which is located on the New Mexico State University campus in Las Cruces!